You buy clothes, you get them dirty, you wash them, and eventually they wear out. That's the way the world always worked until Sidney Stratton develops a miracle fabric that never gets dirty. It stays spotlessly clean whatever happens, and it's an invention that is set to change the world. Sadly the establishment is terrified. How will they keep on making the profits they're used to? And how about the workers, the bosses, the mill owners and the union reps? It turns out everyone is after Sidney's blood, and nobody except the mill owner's daughter Daphne believes in him. 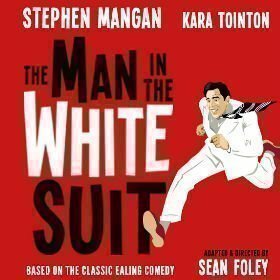 Welcome to The Man in the White Suit, a deliciously silly version of the Ealing Comedy classic dating back to the 1950s. The play keeps the original 1950s styling alive, and Stephen Mangan plays the unfortunate Sidney. Sean Foley, who delighted us by bringing another Ealing comedy classic, The Ladykillers, to the stage, directs, having adapted it from the original film. And the brilliant Kara Tointon plays Daphne. If you fancy a skiffle-filled romp of epic proportions and a story that never loses its lustre, grab tickets for this superbly silly production. http://wyndhams.theatre-tickets.com/ is not affiliated nor endorsed by any production company or theatre venue. The website is provided for informational purposes only and whilst every effort is made to ensure that the information on these pages is correct, we cannot be held responsible for any errors or omissions. Images are the property of the copyright holders and are used with permission. The booking process is provided by LondonBoxoffice.co.uk and booking fees may apply.